The PerfecTemp for Every Occasion. 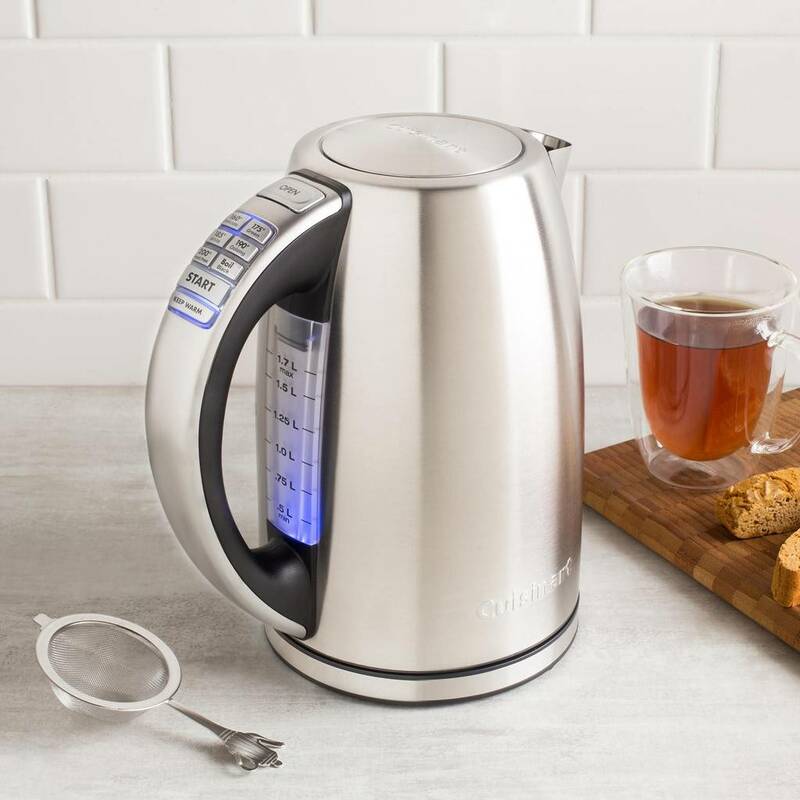 Equipped with 1500 watts of power for fast heating, this electric kettle brings up to 1-2/3 liters of water to a rolling boil in a matter of minutes. Better than that, it offers six different preset heat settings, which allows for steeping tea at just the right temperature depending on the variety. Using the simple one-touch controls on the kettle's handle, select 160 degrees F for delicate teas, 175 degrees F for green tea, 185 degrees F for white tea, 190 degrees F for oolong tea, 200 degrees F for French press coffee, and "Boil" for black tea or to make instant cocoa, oatmeal, noodles, and more. 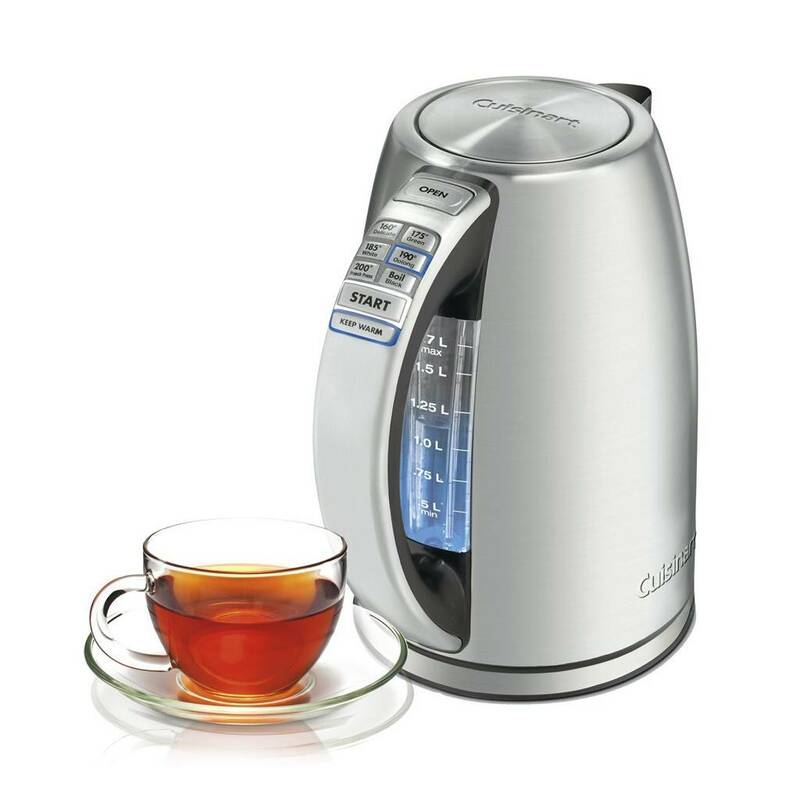 Cuisinart CPK-17 PerfecTemp Cordless Programmable Kettle The control panel also offers blue LED indicators, a "start" button, and a "keep warm" button, which will maintain the set temperature for 30 minutes. For added convenience, the kettle's 360-degree swivel base allows for pouring without the hassle of a power cord getting in the way, and its memory function makes it possible to remove the kettle from its base for two minutes without it shutting off or losing its place in the heating process. Other highlights include a stay-cool nonslip handle, an "open" button for lifting the lid, a blue backlit water window with measurement marks, a concealed heating element to prevent mineral buildup, a removable/washable scale filter, a dripless pour spout, and boil-dry protection with auto shutoff for safety. A user manual with recipes comes included. 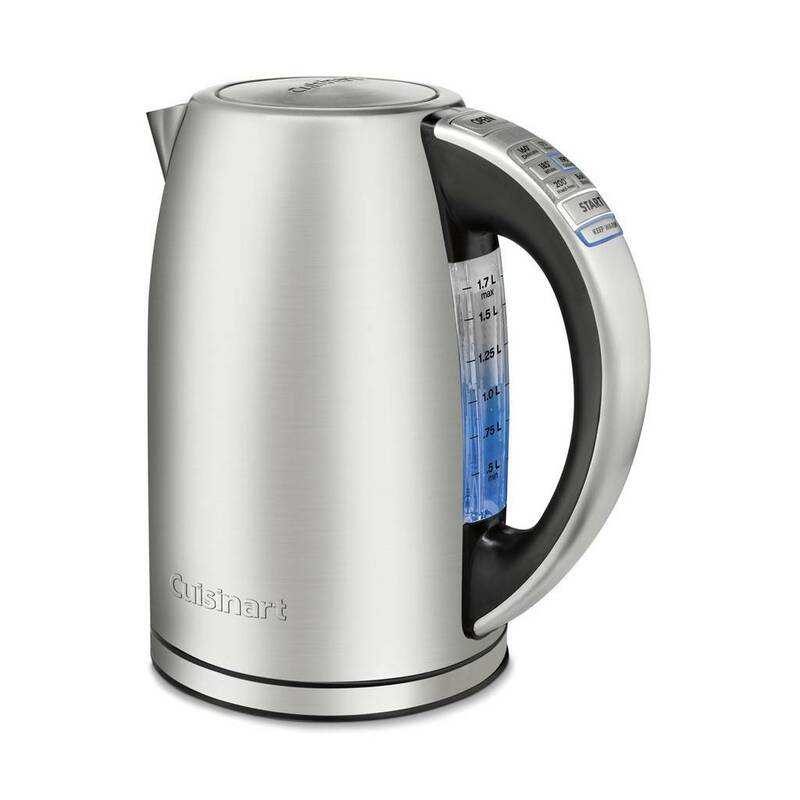 The kettle measures approximately 8-1/5 by 9-4/5 by 12 inches and carries a three-year limited warranty. Parts and Benefits Dripless Pour Spout with Splash Guard keeps counters dry Removable Scale Filter for clean water Easy-Open Lid for quick and easy filling Lid Release Button Preset Temperature Controls with Indicators Delicate (160 F) Green (175 F) White (185 F) Oolong (190 F) Herbal (200 F) Black (Boil 212 F) French Press (200 F) Start (Stop) with Indicator to start/stop the heating process Keep Warm with Indicator maintains the selected temperature for 30 minutes Water Window for a clear view of water level Stay-Cool Handle designed for comfort Power Base with 360 Swivel for cordless convenience Product Overview 1.7-liter capacity 6 preset temperatures One-touch controls with blue LED indicators 30-minute Keep Warm option Memory feature allows kettle to be lifted off base for 2 minutes without shutting off or losing its place in the brewing process 1500 watts for fast heat-up Blue backlit water window 360 swivel cordless connector Stay-cool nonslip handle Concealed heating element to prevent mineral buildup Removable/cleanable scale filter Auto shutoff and boil dry protection Limited 3-year warranty Special Features Memory Feature The kettle features an internal memory that lets you leave the kettle off the base for up to 2 minutes without it going into standby mode. When returned to the base, it will restart the heating and/or Keep Warm cycles right where they left off. Keep Warm Mode Keep Warm is the kettles default function that automatically maintains selected temperature for 30 minutes. If you have selected the Boil preset, your unit will hold a temperature just below boiling during the Keep Warm cycle. To bring water back to a rolling boil, press the Start button twice. Keep Warm can be turned off by pressing the Keep Warm button at any time before or during the heating cycle. Boil-Dry Protection Your kettle is equipped with boil-dry protection. If it starts heating without enough water in the unit, the heater will automatically shut off to avoid damaging the heating element. The lights will flash and the unit will beep to alert you. Once the kettle has cooled down, lift it off the base, then replace it to reset and restart the heating cycle. The quickest way to cool down the heater is to fill the kettle with cold water; however, you can also wait for it to cool down by itself. Sleep Mode If the unit is not in use for 5 minutes, it will revert to sleep mode. The heater and all lights will be off, but your last selections will remain in the units memory. To turn the kettle back on, simply press any button, or lift it up and then return it to the base.